Home of the world's first compound turbo motorcycle. Barry started drag racing on a 500cc Triumph in the 1970s but is best known for his Tokyo Express” Honda CBX turbo funnybike. The CBX ran a best of 7.6 seconds and 179mph in the quarter mile and appeared in numerous magazines and calendars in the 1980s and 90s. The bike was famous for the shrieking exhaust note from its 6 cylinder motor. It remains the world’s quickest turbo CBX. 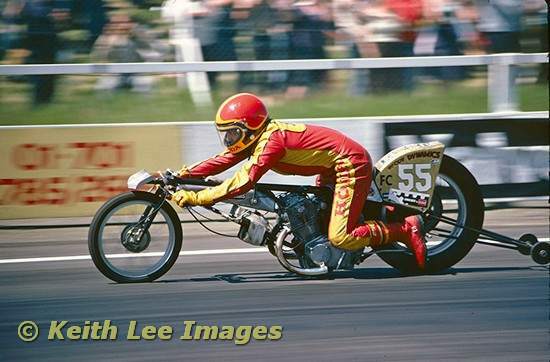 Mike (or “Mick” to many) ran the world’s quickest 250 Honda “Little David” through the 70s and 80s, claiming several world records and a best of 9.08 seconds for the quarter mile in 330cc form. Mike also helped tune Keith Parnell’s “Rouge et Noir” 750cc Triumph to the first 8 second quarter mile run outside the USA, worked on Angus McPhail’s innovative “Jade Warrior”, Barry’s CBX and Lorcan’s 750 turbo. Lorcan is the eldest son of 1970s drag racer Keith Parnell. 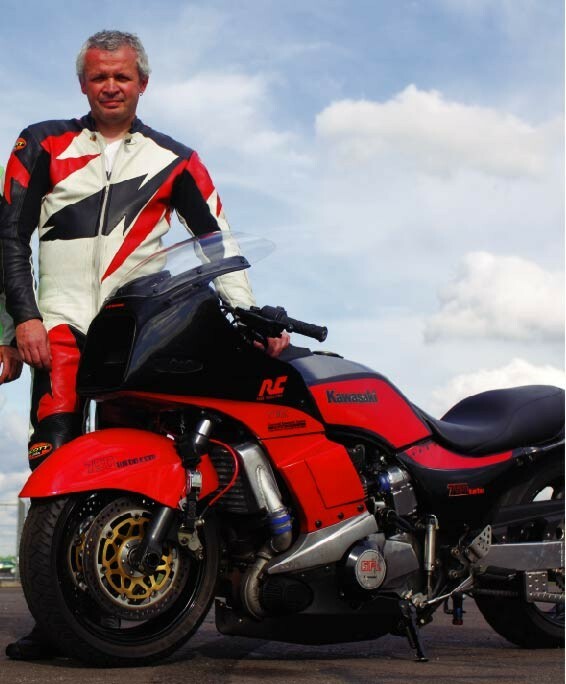 He is best known for his work with Kawasaki GPz750 turbos, one of which became the first ever factory turbo bike to exceed 200mph. 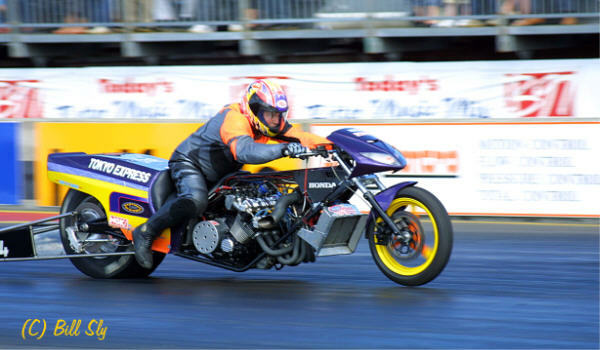 His 810cc street-legal bike was timed at 211mph at RAF Woodbridge in 2006. 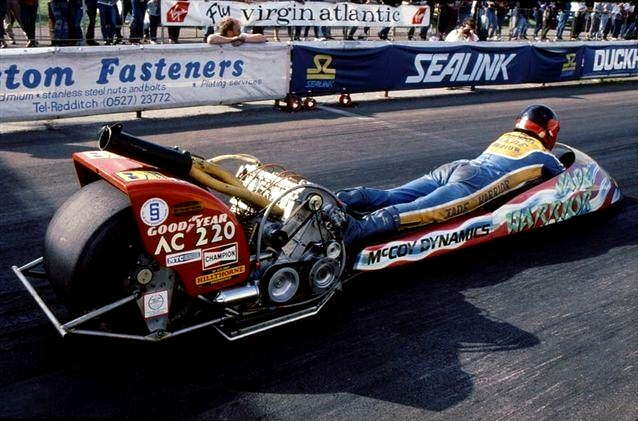 Angus has created some of the most innovative motorcycles in drag racing. His Ford-powered 3 wheeler captured numerous world records and was ultimately banned for having more than one driven wheel, so Angus built the even more fearsome “Jade Warrior” pictured above. This bike featured a supercharged 2 litre 16-valve engine driving through a torque converter (no gearbox). It had a tiny frontal area, a built-in tyre warmer and exhaust-driven ground effect which provided downforce even at a standstill.